Artist's illustration of the supernova remnant known as 1993J, which came from a double-star system. Fast-moving, charged particles called cosmic rays that were blasted out by asupernova may have played a role in the climatic changes that apparently led to a die-off at the end of the Pliocene epoch and the start of the Pleistocene, researchers said. "I was expecting there to be very little effect at all," Melott said, noting that 300 light-years is not very close. The results were therefore surprising. The team's simulations suggest, for example, that such supernovas bathed the night sky in blue light so bright that it disrupted animals' sleep patterns for weeks. And, more importantly, a surge of radiation probably hit organisms on land and in the shallower parts of the ocean. "The big thing turns out to be the cosmic rays," Melott said. "The really high-energy ones are pretty rare. They get increased by quite a lot here — for a few hundred to thousands of years, by a factor of a few hundred. The high-energy cosmic rays are the ones that can penetrate the atmosphere. They tear up molecules. They can rip electrons off atoms, and that goes on right down to the ground level. Normally, that happens only at high altitude." The end result was likely a tripling of the overall radiation dose at ground level, the researchers found. This may have been enough to increase cancer and mutation rates, "but not enormously," Melott said. "Still, if you increased the mutation rate, you might speed up evolution." This radiation may also have affected Earth's climate, the study said. The team's simulations suggest that the increased flux of cosmic rays caused many of the atoms and molecules in the lowest layer of Earth's atmosphere (known as the troposphere) to acquire a positive or negative charge. This "tropospheric ionization" likely lasted for at least 1,000 years, the researchers said. The Pliocene-Pleistocene extinction was quite a minor one as far as these events go. 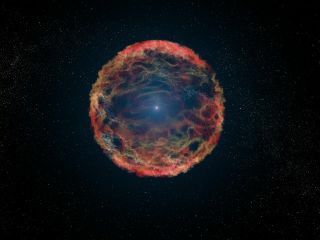 Previous studies have suggested that a supernova would have to be quite close to Earth — within 25 light-years or so — to trigger a major mass extinction such as the one 65 million years ago that marked the end of the age of dinosaurs.